Mortgages are an important part of any housing finance system, and impact significantly on housing affordability, as well as on housing supply. Mortgage products are available in 46 of the 51 countries surveyed in the 2016 CAHF Housing Finance Yearbook – but their rates and terms vary widely and their practical availability is hard to tell. While mortgages may be a significant part of the financial system in South Africa, most countries are only beginning to develop their markets: Tanzania’s mortgage market is still very small, with 3 891 reported mortgages as of December 2016. In Malawi, one bank reported that it had a total mortgage book of 17 loans. Nevertheless, to better understand mortgage market development, CAHF has been collecting data on mortgage interest rates, loan tenor and down payment requirements, where this data is available, for the past few years. We collect data from our in-country authors who contribute to our yearbook, as well as from internet searches that we undertake. While the absolute numbers are interesting and offer a useful indication of affordability (assuming the loans are indeed available), comparing changes year-on-year also offers an interesting story. See our dashboard on Calculating Mortgage and Housing Affordability in Africa. The graph below shows the mortgage interest rates and loan tenor in 52 countries across the continent as collected in 2015 and 2016. 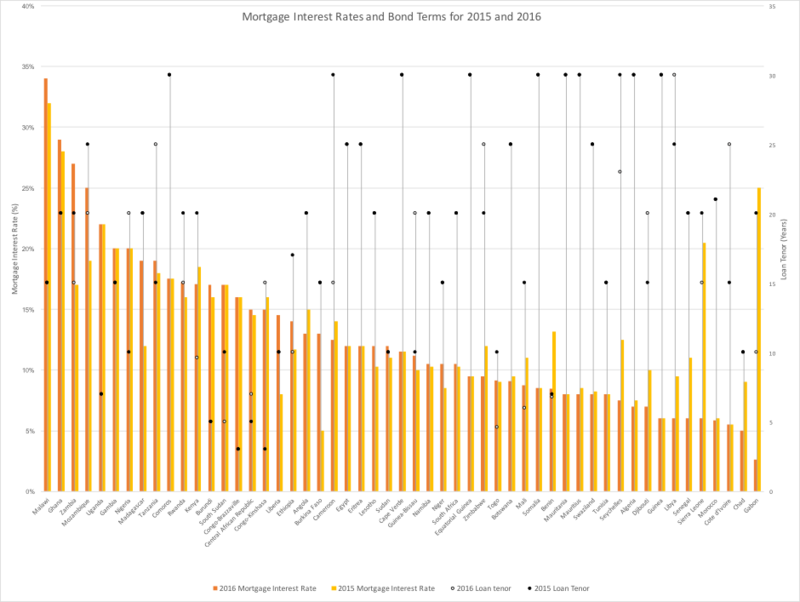 Mortgage rates are still high: on average, for the countries represented in the graph, the mortgage interest rate was 12.74 percent in 2016 dropping by 0.40 percent from 2015, and ranging from an impossibly high 34 percent in Malawi in 2016, to a low of 2.5 percent in Gabon, also in 2016. Nineteen countries saw mortgage affordability decrease, as the average mortgage interest rate rose; while the same number of countries had a decrease in mortgage interest rates, reflecting improving affordability. The average loan tenor for the countries represented was 18 years in 2016 dropping by one year from 2015. Eight countries had an increase in average loan tenor and a quarter saw the average loan tenor decline. 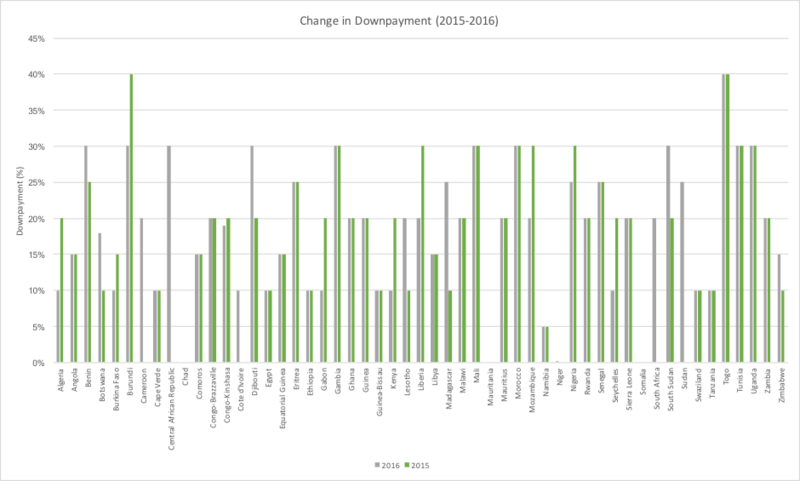 The graph below shows the change in required down payment by country from 2015 to 2016. The 40 percent downpayment required in Togo is a significant constraint on housing affordability in that country. More common is a 20 percent deposit – an important issue for financial sector stability but nonetheless difficult in markets where the majority of prospective borrowers are first time homebuyers without equity. Ten countries have had a decrease in the down payment required for a mortgage and seven have had an increase. On average, for the countries represented below, the down payment was 18 percent in 2016 up from an average of 17 percent in 2015. The impact of these changes is explored below using the Calculating Mortgage and Housing Affordability in Africa dashboard. In Libya, an increase in loan tenor from 25 to 30 years, and a decrease in the mortgage interest rate from 9.5 percent to six percent was recorded, made mortgages much more affordable in 2016. The down payment remained the same at 15 percent. Using this input into our calculator (assuming a 100 percent mortgage), we find that while about 80 percent of the urban household population could afford a US$ 10 000 house in 2015, this increased to about 96 percent of the urban household population in 2016. What is it that led to these changes? Better access to long term finance, perhaps, and a more stable interest rate environment – both critical macro-economic issues for access to affordable housing finance. Mortgage affordability in Ethiopia went in the opposite direction. An increase in the mortgage interest rate from 11.7 percent in 2015 to 14 percent in 2016 was recorded, together with a shortened loan tenor from 17 to 10 years. The down payment remained the same at 10 percent for both years. The effect of this on a borrower of a $10 000 mortgage is significant (assuming a 100 percent mortgage): a monthly increase of US$ 42, or almost 27 percent, simply as a result of lending terms. In the long term, because of the shorter loan tenor, the borrower does save. However, this benefit can be enjoyed by a smaller number of people: in 2015, while about 2.8 percent of Ethiopia’s urban household population could afford a US$ 10 000 house, less than one percent could afford this under the 2016 lending terms. While the mortgage interest rate remained unchanged in Nigeria between 2015 and 2016, loan tenor was extended by ten years and the required down payment was decreased by five percent, improving access and monthly affordability slightly, while increasing the long term cost of the loan for the household. On a $10 000 loan, for example, the monthly repayment decreased from $193 to $170 assuming a 100 percent mortgage. The payment over the term increased, however, from US$ 26 191 in 2015 to US$ 43 272 in 2016. The mortgage interest rate in Tanzania increased by one percent in 2016 (from 2015). At the same time, the required deposit remained at 10 percent, and the loan tenor was extended to 25 years in 2016. The increase in loan tenor improved monthly affordability, but of course impacted negatively on the overall costs of the loan. In each of these countries, there is a story behind the changing figures. Higher interest rates and shorter loan tenors reflect macro-economic conditions in which access to affordable, long term finance is constrained. These are critically important issues for policy makers to monitor, and influence, as they can have a profound effect on the health and functioning of a country’s mortgage market and access to affordable housing. Please feel free to contact us with any comments, feedback and questions that you may have.